ART TOUCH COLLECTION is pleased to present Energy of Emptiness, a special exhibition of two bronze sculptures (see images I and II, left) by the Taiwanese artist, Li Chen. The exhibition is at a home setting to bring about a sense of intimacy and ease that the sculptures emanate. 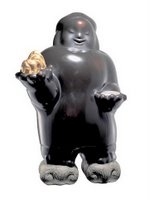 Although made of bronze and depicting the round physique of the Buddha, the sculptures project an air of buoyancy that will most likely lift the spirit of not just Zen seekers. Li brings his cultural root and philosophical pursuit to his art practice, with a sense of humor. He fuses the oriental spirituality into a contemporary art form with his unique vision of scale and superb sculptural techniques, while retaining the quality of childlike innocence in all of his work. Through his work, we experience the co-existence of emptiness and fullness; simplicity and complexity. Gallery hours are Tuesday through Saturday, 11am to 4pm or by appointment. For further information please contact Lillian Lum at 203 661-0140 or info@arttouchcollection.com.